There is a fascinating research paper called “Colour as a Signal for Entraining the Mammalian Circadian Clock” that has just been published in the open access journal PLOS Biology (Walmsley et al. 2015). While it is an exceedingly technical paper, the basic premise is this: the change in yellow-blue color ratio during twilight may be more effective in entraining circadian rhythms (at least in mice) than changes in daylight intensity. The goal, of course, is to provide electric lighting that mimics the temporal changes in natural daylight that we as a mammalian species experienced on a daily and seasonal basis prior to the introduction of electric lighting. Roos’s advice – which is reasonably good – is based on numerous medical studies over the past decade or so concerning our circadian rhythms and their relation to light exposure. The latest paper, however, demonstrates in no uncertain terms that our knowledge of circadian rhythms is incomplete. While it does not necessarily negate the above advice, it does bring to mind new questions and possible opportunities for lighting design. To better understand this topic, we begin with circadian rhythms, which Wikipedia defines as “any biological process that displays an endogenous [i.e., self-sustained], entrainable oscillation of about 24 hours.” In humans, these daily rhythms include those shown in Figure 1. Figure 1 – Human circadian rhythms. Source: Wikipedia. These rhythms are entrained (i.e., synchronized) by external cues called zeitgebers (“time-givers”), the most important being – as you might expect – changes in daylight. We become acutely aware of these rhythms when we suffer from jet lag. Specifically, the change in daylight schedule disrupts our circadian clock, leaving us physically exhausted and having difficulties sleeping. From a clinical perspective, there are several ways of measuring circadian rhythms in human subjects. One way is to measure the core body temperature, but this involves placing a temperature sensor somewhat uncomfortably “where the sun don’t shine” in the subject’s body. Another more reliable method is to measure the concentration of the hormone melatonin in the subject’s blood or saliva (e.g., Benloucif et al. 2005). The disadvantage, of course, is that the subject is sleeping when melatonin is present in measurable quantities. In short, reliably measuring circadian rhythms in humans is not an easy task. There are numerous studies that correlate the secretion of melatonin in the body with circadian rhythms (e.g., Revell et al. 2005). What is more interesting to lighting designers, however, is the relation between melatonin secretion and the human eye. In addition to the cones and rods that provide us with color and night-time vision respectively, the mammalian retina has intrinsically photosensitive retinal ganglion cells (ipRGCs) that play a major role in entraining our circadian rhythms (e.g., Zaidi et al. 2007). The relationship between ipRGCs and melatonin secretion has been extensively studied (e.g., Lucas et al. 2013). These cells are connected to a region deep in the brain called the suprachiasmatic nucleus (SCN). When the ipRGCs do not receive light for an hour or more, the SCN triggers the pineal gland within the brain to begin secreting melatonin, which in turn promotes sleep in humans. Of particular interest to lighting designers is the spectral responsivity of the ipRGCs. Whereas our cones and rods have spectral responsivities defined by the V(l) and V’(l) functions for photopic and scotopic vision, ipRGCs have a different spectral responsivity, referred to as melanopic (FIG. 2). Figure 2 – Human spectral responsivity. This has become the basis for today’s evolving recommended practices in circadian-based (aka “biologically-effective” in Europe) lighting. For example, DIN SPEC 67600, Biologically Effective Illumination – Design Guidelines (DIN 2013) bases its recommendations solely on melanopic illumination. 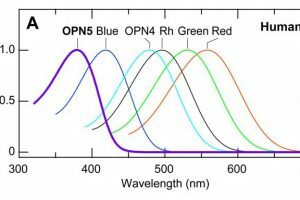 Similarly, luminaire manufacturers are currently looking at ways of optimizing the spectral power distributions of their products to produce biologically-effective white light; that is, white light with an abundance of blue light centered on the melanopic peak wavelength (e.g., Roos 2015). … but science is all about endlessly attempting to prove that everything we think we know is either wrong or incomplete. Designing biological experiments is intrinsically difficult. You begin by hypothesizing that some action x will result in some event y. You then design an experiment in an effort to determine the correlation between the action and the event. For example, you may want to administer a vaccine and see whether it protects human subjects from contracting some viral disease. The difficulty comes in designing the experiment. You do not, for example, want to administer an Ebola vaccine to a group of subjects living in North America – the likelihood of their being exposed to the Ebola virus is essentially zero. The experimental design in this case would be clearly biased towards an extremely positive (but essentially meaningless) correlation. Taking circadian rhythms as another example, one problem is that the variability of retinal illuminance due to daylight exposure is typically both high and unpredictable due to cloud cover. The solution to this problem is appealingly simple: ensure that the subjects are exposed to electric lighting whose intensity and spectral power distribution (or at least its correlated color temperature) can be tightly controlled. By eliminating uncontrolled variables such as daylight, the experiment becomes more predictable and, most important, repeatable. Melatonin secretion is an indicator of the circadian rhythm associated with sleep. These assumptions are of course based on many previous experimental results. They are still however assumptions – what if they prove to be wrong or incomplete? In their paper “Colour as a Signal for Entraining the Mammalian Circadian Clock,” Walmsley et al. (2015) began with a markedly different hypothesis. Noting that the mammalian circadian clock must have evolved over hundreds of millions of years, they reasoned that it makes sense to begin with natural daylight as the zeitgeber. They therefore began by measuring the spectral power distribution of daylight from 280 to 700 nm over a period of 41 days (September through October) from a location in Manchester, UK. The data were then carefully averaged to obtain a typical day in terms of absolute spectral irradiance. The results were surprising. As shown in Figure 3, the variation in twilight color (horizontal axis) over 41 days is much less than the variation in irradiance (vertical axis), a result the authors attribute to ozone absorption in the upper atmosphere when the sun is below the horizon (Hulbert 1953). Figure 3 – Daylight color versus irradiance variability. Source: Walmsley et al. (2015). The key here was not to assume, for example, that ipRGCs influence melatonin production and so eliminate as many experimental variables as possible, but to recreate as natural a luminous environment as possible for the test subjects (which in their experiments were laboratory mice). Using this information, the authors designed a LED-based lighting system for their laboratory mice. Unlike humans with their red-, green-, and blue-sensitive cones (technically long-, medium-, and short-wavelength sensitivity, designated SWS, MWS, and LMS respectively), the retinal cones of wild mice are primarily sensitive to ultraviolet (UVS) and green (MWS) wavelengths (FIG. 4), as determined by the various photosensitive opsins found in these specialized cells. Figure 4 – Wild mouse spectral responsivity. Source: Walmsley et al. (2015). Unfortunately, the green-sensitive (MWS opsin) cones overlap in sensitivity with the rod (scotopic) and ipRGC (melanopic) sensitivities, which complicate the issue of measuring circadian clock entrainment. The authors therefore used a transgenic breed of mice called OpnlmwR, in which the MWS opsin cones are replaced by human long-wavelength sensitive (LMS) cones. These mice basically see ultraviolet (365 nm peak) and amber-red light (564 nm peak) only, regions of the spectrum to which the rods and ipRGCs have little to no sensitivity (Walmsley 2015, Lucas 2014). Rather than measuring melatonin levels, the authors surgically implanted tiny temperature loggers in the mice to measure core body temperature as a biological marker for circadian rhythms. The mice were then exposed to temporal lighting conditions that recreated a summer’s day in Stockholm, Sweden, including twilight, over a period of two weeks. The northern latitude was chosen specifically to achieve a protracted period of twilight and so maximize its influence on circadian rhythm entrainment. The rest of the experiment involved some rather gruesome details involving decapitation and sliced brains in order to measure responses of the SCN to amber and ultraviolet light. What the authors found was that the ratio of amber-to-ultraviolet light (which correspond to the yellow-blue light ratio in humans) had a considerably greater effect on circadian rhythm entrainment than did the variation in absolute intensity of amber-plus-ultraviolet light with constant color ratio. What is significant about this is that the ratio of yellow-to-blue light remains reasonably constant throughout the day, but changes drastically and consistently before sunrise and after sunset (FIG. 5) over a period of about 30 minutes (that is, twilight). Conversely, the intensity of daylight may vary randomly and markedly throughout the day due to cloud cover. From an evolutionary perspective, it therefore makes more sense for the mammalian circadian clock to have evolved to respond to color rather than intensity changes in daylight as its zeitgeber. Figure 5 – Yellow-blue daylight ratio. Source: Walmsley et al. (2015). From an electrical engineering perspective, it also makes sense that the color change (which happens rapidly and predictably) would become an important zeitgeber. In terms of phase-locked loop design, a sudden but consistent periodic pulse is better for entrainment than a variable and noisy signal such as daylight intensity. This is not to say of course that ipRGCs and rods do not also play a role in circadian rhythm entrainment – they do (e.g., Güler et al. 2008). Further studies will (as always) be required to tease out the relationship between cones, rods, and ipRGCs in this process. This paper shows that the science may be much more complicated. Its value as an academic study is that it demonstrates that under “natural” conditions involving daylight, blue-yellow color discrimination complements, and may even dominate intensity changes via ipRGCs in circadian rhythm entrainment. At the same time, however, these natural conditions do not reflect the decidedly artificial conditions we subject ourselves to with electric lighting, particularly at night or at the end of a night shift. It has, for example, been established that several hours of exposure to high-CCT illumination from tablet computers can significantly disrupt our circadian rhythms (van der Lely et al. 2015). It is also important to recognize that it is the change in yellow-blue color ratio that influences circadian rhythm entrainment in natural lighting conditions, not the color ratio itself. Studies using lighting with constant color temperature (e.g., Bellia et al. 2014), which found that different color temperatures have little effect on circadian stimulus, may be eliminating precisely those experimental variables that are of the most interest. Without predicting the results of future studies, suppose that the dominant geitzeber for circadian rhythm entrainment is the change in yellow-blue color ratio of daylight rather than constant or even changing melanopic illuminance. If this proves to be true, then the current recommendations for circadian-based / biologically effective lighting may be in serious need of revision. If this does prove to be true, however, it may simplify the lighting design requirements. It would, for example, be much easier to use color-tunable luminaires with programmable color temperatures that change to signal the beginning and end of the day, than it would be to ensure absolute levels of melanopic illuminance. 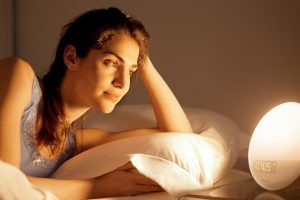 There are conflicting opinions about whether we know enough about the circadian system in humans to design biologically-effective lighting systems. The current paper will do nothing to resolve this debate, as it shows how little we really do know. On the other hand, I prefer to take a positive approach. It is difficult to imagine a situation where any reasonable lighting system design can physically harm people. Given this, I have no problem with taking the “best available science” and designing lighting systems accordingly. Whatever recommendations we have will most likely involve programming of color-tunable luminaires with varying spectral power distributions and intensity on a daily cycle. The beauty of this is that as the science improves, the lighting systems will only require a software or driver firmware update. In the meantime, more research is (as always) required. Bellia, L., A. Pedace, and G. Narbato. 2014. “Indoor Artificial Lighting: Prediction of the Circadian Effects of Different Spectral Power Distributions,” Lighting Research and Technology 46(4):650-660. Benloucif, S., M. J. Guico, K. J. Reid, L. F. Wolfe, M. L’hermite-Balériaux, and P. C. Zee. 2005. “Stability of Melatonin and Temperature as Circadian Phase Markers and their Relation to Sleep Times in Humans,” Journal of Biological Rhythms 20(2):178-188. DIN. 2013. Biologically Effective Illumination – Design Guidelines, DIN SPEC 67600 (2013-04). Deutsches Berlin, Germany: Institut für Normung e.V. Güler, A. D., J. L. Ecker, G. S. Lall, S. Haq, C. M. Altimus, H. W. Liao, A. R. Barnard, H. Cahill, T. C. Badea, H. Zhao, M. W. Hankins, D. M. Berson, R. J. Lucas, K. W. Yau, and S. Hattar. 2008. “Melanopsin Cells are the Principal Conduits for Rod-cone Input to Non-image-forming Vision,” Nature 453(7191):102-105. Hulbert, E. O. 1953. “Explanation of the Brightness and Color of the Sky, Particularly the Twilight Sky,” Journal of the Optical Society of America 43(2):113–118. Revell, V. L. H. J. Burgess, C. J. Gazda, M. R. Smith, L. F. Fogg, and C. I. Eastman. 2005. “Advancing Human Circadian Rhythms with Afternoon Melatonin and Morning Intermittent Bright Light,” Journal of Clinical Endocrinology & Metabolism 91(1):54-59.
van der Lely, S., S. Frey, C. Garbazza. A. Wirz-Justice, O. G. Genni, R. Steiner, S. Wolf, C. Cajochen, V. Bromundt, and C. Schmidt. 2015. “Blue Blocker Glasses as a Countermeasure for Alerting Effects of Evening Light-Emitting Diode Screen Exposure in Male Teenagers,” Journal of Adolescent Health 56(1):113-119. Walmsley, L., L. Hanna, J. Mouland, F. Martial, A. West, A. R. Smedley, D. A. Bechtold, A. R. Webb, R. L. Lucas, and T. M. Brown. 2015. “Colour as a Signal for Entraining the Mammalian Circadian Clock,” PLOS Biology, April 17. Zaidi, F. H., J. T. Hull, S. N. Peirson, K. Wulff, D. Aeschbach, J. J. Gooley, G. C. Brainard, K. Gregory-Evans, J. F. Rizzo, C. A. Czeisler, R. G. Foster, M. J. Moseley, and S. W. Lockley. 2007. “Short-wavelength Light Sensitivity of Circadian, Pupillary, and Visual Awareness in Humans Lacking an Outer Retina,” Current Biology 17(24): 2122-2128. In humans, our neural circuitry combines the signals received from the short-wavelength sensitive (SMS) cones with the combined signals from the medium-wavelength sensitive (MWS) and long-wavelength sensitive (LWS) cones to generate blue-yellow discrimination. This opponent color theory posits that our color vision consists of blue-versus-yellow, red-versus-green, and black-versus-white channels that our brains further process. Given evolution’s penchant for recycling good ideas, it may be that the blue-versus-yellow signal also contributes to circadian rhythm entrainment. The authors speculate that this may even have been the original evolutionary purpose of color vision.